I’m pleased to introduce you to my first guest reviewer today – my daughter Grace! Grace read The House of New Beginnings on holiday and enjoyed so much I suggested she write a review for the blog. So over to Grace for her first blog review. I know I’m biaised but I think she’s done rather well! “The House of New Beginnings” was the first book I have read by Lucy Diamond. It will, however, most certainly not be the last! This is the story of three women making a new life in Seaview House on the coast in Brighton. In Flat 1 is Rosa; recently running away from a disaster in her previously perfect London life, she is pursuing her dream of becoming a chef. Flat 3 is where Georgie lives; she followed her boyfriend Simon down to Brighton where he has been offered an architecture job. Georgie decides to try her hand at journalism and is soon faced with a mixture of new adventures and disaster! Flat 4 nurses a grieving Charlotte; she has lost her infant daughter and with that loss her life became turmoil so she too has run to Brighton to start over. What with Jo and Bea in Flat 2 and the fabulously eccentric (and French!) Margot on the top floor, there’s bound to be enough drama to make a book full of fun! (SPOILER: there is plenty drama and it is definitely fun filled). One of my favourite things about “The House of New Beginnings” is how relatable all the characters are. Hearing about their woes is just like having one of your girls (or guys!) phone you up to have a little moan. The character development is really amazing as you get to watch these three women come out of their shells and reveal interesting personality traits that were previously quelled. My favourite character was Margot on the top floor. She was, in a word, vivacious. A genuinely inspiring character. She makes you think about life, the chances you take and the way you react to the obstacles that are placed before you. The plot may not be a thriller or a gripping crime but still I found myself yearning to know more of the goings on of Seaview House. Now this may seem a touch melodramatic but reading this book rekindled my love of reading (I did my exams this year so school got in the way of a lot of things). Within a day of finishing “The House of New Beginnings” I went out and bought three new books. If that doesn’t show how fabby this book is I don’t know what will! Now, if you like my mum’s blog at all and want to make me a very happy bunny, please, please, PLEASE go and pick yourself up a copy of “The House of New Beginnings”. Seriously, it’s just a teeny trip down to your closest Asda*! You won’t regret it! *Other supermarkets probably stock it too if they know what’s good for them! One life-changing summer . . . In an elegant Regency house near the Brighton seafront, three tenants have more in common than they know . . .
A shocking revelation has led Rosa to start over as a sous chef. The work is gruelling but it’s a distraction . . . until she comes up against the stroppy teenager next door who challenges her lifestyle choices. What if Rosa’s passion for food could lead her to more interesting places? Having followed her childhood sweetheart down south, Georgie is busily carving out a new career in journalism. Throwing herself into the city’s delights is fun, but before she knows it she’s sliding headlong into all kinds of trouble . . . Nursing a devastating loss, Charlotte just wants to keep her head down. But Margot, the glamorous older lady on the top floor, has other ideas. Like it or not, Charlotte must confront the outside world, and the possibilities it still holds. As the women find each other, hope surfaces, friendships blossom and a whole new chapter unfolds for them all. Brilliant! Well done, Grace. Watch out, Joanne! Brilliant Grace, I loved your review and will be adding it to my TBR. Please let this be the first of many. Hi Grace. 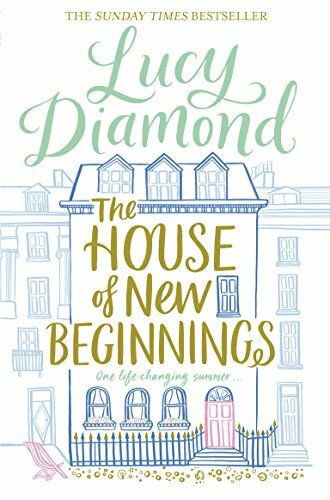 I enjoyed reading your review for The House of New Beginnings by Lucy Diamond. This sounds like a must-read. I do love stories of disparate characters who come together and influence each other’s lives. You’re right: sometimes you don’t need a gripping plot – think of Hotel du Lac, for instance. I will packing this novel in my beach bag. Thanks for the heads-up. Grace you’re a natural. Great review. Keep reading and keep reviewing. Great review, Grace! Well done! Impressive. You are a good writer, Grace. You captured the essence of the plot and characters as you gave them a chance to unfold. Bravo!